Power, style, luxury, elegance… What else does a woman need from her work wear? Look no further! 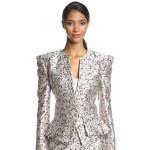 This fabulous “Zac Posen Floral Jacquard Skirt Suit” checks off all the boxes. Posted in • work clothes and tagged zac-posen on April 21, 2015 by aubadegirl. Posted in • work clothes and tagged zac-posen on November 7, 2014 by aubadegirl.